FORT WARD, BAINBRIDGE ISLAND: Up in the rafters, under the earth and everywhere in between, restoration of Fort Ward’s historic bakery building is making giant strides in spring 2019. 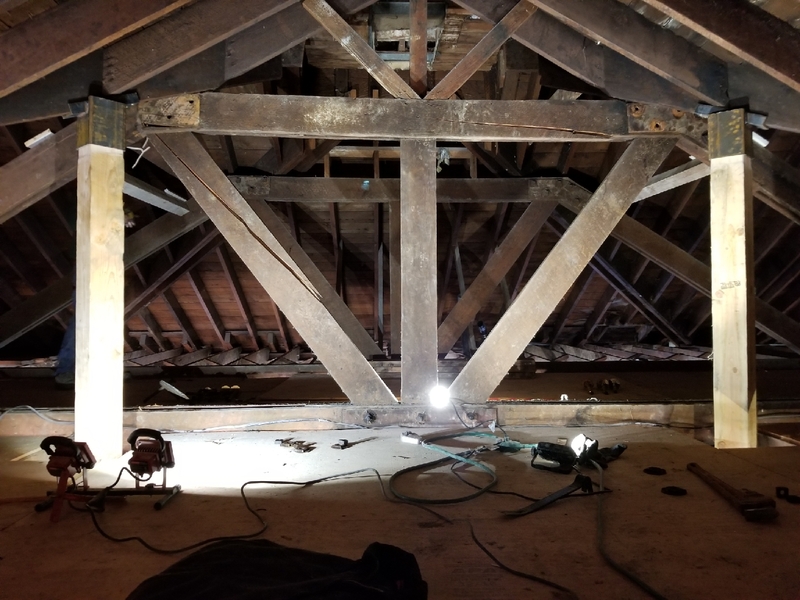 Here’s an update on masonry restoration, repairs to the century-old rafters, our new custom corbel knee-braces and plinth, and more. For more images of the work, see the new spring 2019 gallery at http://www.fortwardhall.org. And remember to Like us at www.facebook.com/friendsoffortward for the most up-to-date reports (and lots more photos) on the bakery restoration. HITTING A BAD PATCH – AND MAKING IT GOOD: Some days we correct for time, some days for error. 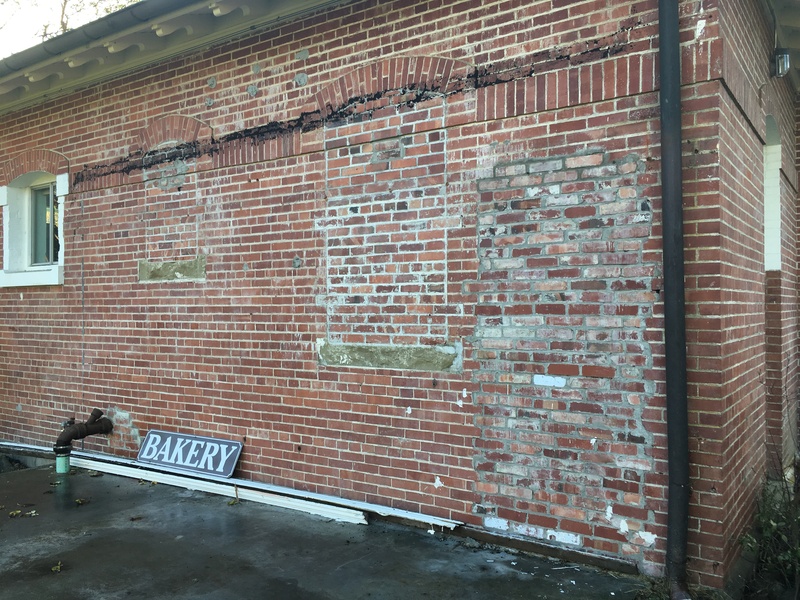 Restoration of the historic Fort Ward bakery’s beautiful brick shell has largely been an exercise in the latter: fixing things that someone, somewhere along the way, screwed up. Like the jagged hole hacked through the back wall to run a dryer vent. Or the splendid corbel plinth smashed flat when the front porch was hideously enclosed. Or the … but we could be at this for a while. Suffice it to say our restoration masons have been correcting these many slights and offenses against the building’s architectural integrity, with great patience and skill, one after the next. Eric of Masonry Restoration Consulting with the bakery’s newly repaired front wall. With their lengthy task list winding down, the ace team from Masonry Restoration Consulting Inc. of Lake Stevens – PJ, Toby, and Eric – turned their attention to one of the last big jobs, maybe the one you’re most likely to notice: Fixing the terrible patch job on the building’s north face. It’s been an eyesore for decades, a blight on the building and a visual assault against all passersby. What happened? Sometime in the 1940s, when the old Army bakery was repurposed as a power station for Naval Radio Station Bainbridge Island, someone in the chain of command decided the building wasn’t big enough. It needed another room, probably a bunkhouse and shower for whoever kept the big generator running. The north wall before restoration. Note the very poor patch over the 1940s-era doorway. A concrete pad was poured and a new frame structure grafted on. But instead of just framing in a simple entrance, they – egregiously – punched the doorway through the bakery wall. Ouch. Worse, when the add-on was finally torn down and the doorway patched up, the repair job could charitably described as … amateurish. Mismatched and damaged bricks, thrown together in uneven rows. Gobs of mortar. Sloppy pointing. Just terrible work all around. As masonry goes, it was the typographic equivalent of a ransom note. “Some staff sergeant probably said, ‘Fill it! I don’t care what it looks like,’” mason Eric mused, as he took up the trowel to make things right. Going into the bakery restoration, we weren’t even sure this blight could be fixed. We talked about just buying a big potted tree, setting it in front of the wall and hoping Fort Ward Community Hall users wouldn’t notice. But for the restoration masons, hey, no problem. The fix actually got underway before Christmas; as PJ and Toby methodically reopened bricked-over windows, they also chiseled away the outer layer of the ad-hoc patch job. With the wall void exposed, they could add an extra wythe (vertical layer) for strength. Now it was time to set the outer wythe. While most repairs have used reconditioned bricks salvaged from around the bakery, this job called for new color-matched units sourced from an area supplier. Purchased oversized, each brick was cut down to length and meticulously set into place, one course upon the next. It looks great. In fact, when the weathered wall around it gets a gentle cleaning, the new work should blend right in. Quite an improvement over last try. Pays to hire real masons! There’s one more big job ahead in the masonry phase, and we promise you’ll notice that one too. For now, take a stroll by the bakery and admire this fine work by our skilled masons, and a big brick wall where past and present meet with barely a seam. 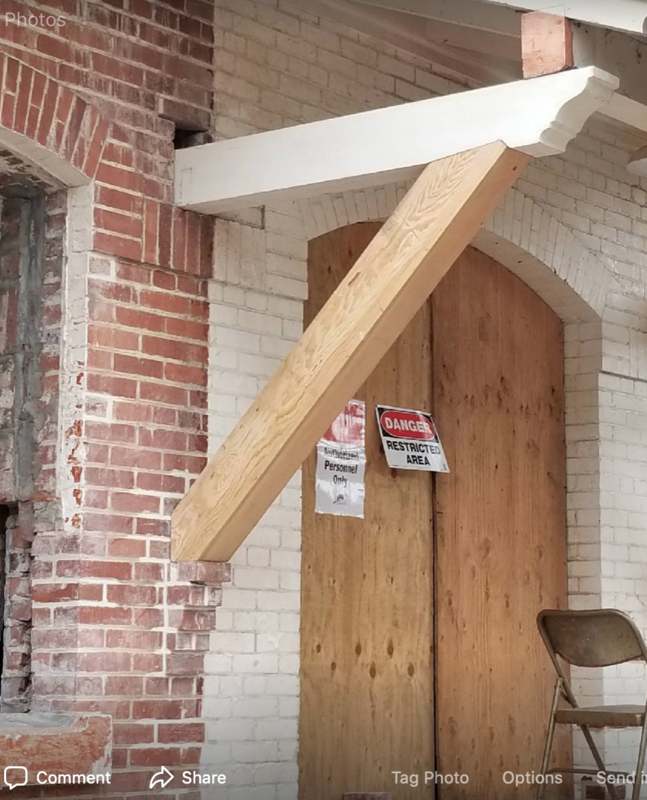 RAFTER REPAIRS – THIS MAKES US BEAM: It was spring 2007, and the Fort Ward Sewer District has just purchased the fort’s historic bakery building for restoration – someday – as a community hall. 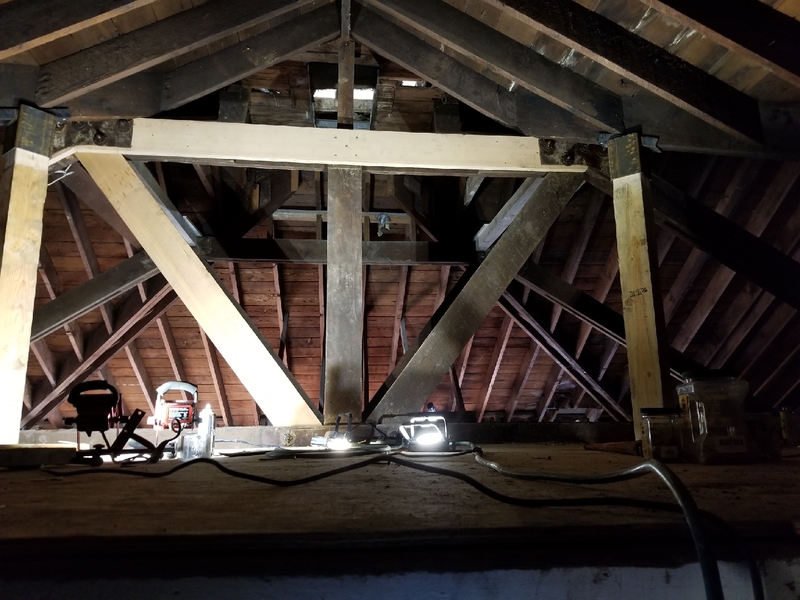 Tagging along with Mike Yuhl, sewer district engineer, and Don Ashton, retired architect and Fort Ward neighbor, your correspondent ventured up into the bakery attic to see firsthand what were described as failing rafters needing serious repair. What we found (besides grime and years of accumulated junk): Several of the long beams that span the main room had split at some point over the bakery’s then-97-year history. Yikes! The roof would stand (with some stopgap bracing by Mike), but any long-term restoration would have to address this structural issue. No way around it. New custom-milled fir rafters in the bakery’s attic. In this case, “Like” would mean some particularly high-grade fir beams, custom milled for the application. Our quest led us to Angeles Millwork & Lumber of Port Angeles. While we’ve sourced most of our milling needs on the island, this time we found what we needed amongst the towering trees of the Olympic Peninsula. Four 12-foot spans of clear fir … and boy, were they clear. Beautiful vertical grain, and not a knot to be found. Thank you, precious Northwest forests – we’ll put these to good use, we promise. The original rafters — note that several had split, from time or the weight of the ceiling below. While we’ll never know exactly why the old rafters split – “time” is a perfectly plausible guess– we suspect it might have had something to do with the load of the bakery’s original ceiling of cement and metal lath. That ceiling was HEAVY – a ridiculous 15 lbs. per square foot. Given the main room is about 950 sf., that’s over 14,000 lbs. of mass that’s been pulling the roof toward the floor all these years. No wonder something finally gave. By contrast, the new ceiling of 5/8-inch sheetrock should weigh in at a tidy 2.3 lbs. per square foot. You can almost feel the building shake its shoulders and heave a sigh of relief. To bring this project element full circle, we shared pictures with our engineer emeritus Mike Yuhl, now retired to Lake Sammamish. Mike’s response: “WOW!” Thanks, Mike – it took a while, but we did it. Maybe there was never any doubt. Longtime South Beach resident and fine woodworker John Steiner, who calls the bakery’s intricate roof truss system “a work of art,” said he would have been confident even without the temporary bracing (although he understood the precaution). Referencing R. Buckminster Fuller, who popularized the geodesic dome, John described the bakery’s roof structure as exemplifying “self-supporting pattern integrity.” That is, the design is such that it basically holds itself up. After a century-plus, it’s hard to argue. And now we’re sure. 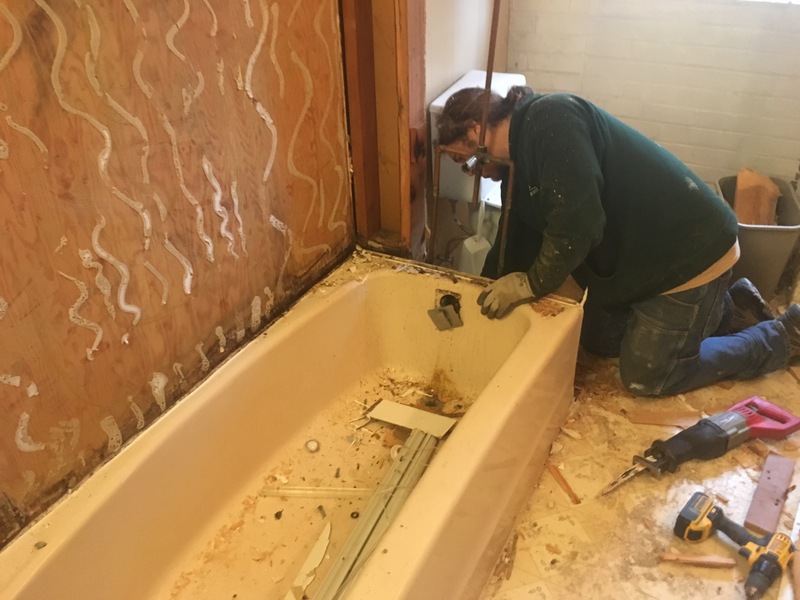 RESTORING THOSE KNEE BRACES – THE B’S KNEES: One of the primary elements of the bakery project has been restoring the beautiful original facade. Among other details, that entailed milling and cutting new knee braces to hold up the front porch overhang, specifically the two braces left of the door as you face the building. The original pair were destroyed when the porch was enclosed many years ago. Fortunately, we had the other pair (and the original 1908 blueprints from the National Archives) to work from and copy. The new knee-brace system supporting the bakery’s front porch overhang. But this was an interdisciplinary element that also required some crafty work by our masons. More on that in a moment; first, the braces. While the work isn’t quite done, the two new braces got plugged in recently to see how they fit – very nicely indeed. Note how the diagonal brace is inset slightly into the horizontal beam end with an angled cut to support the load above, negating the need for a vertical pillar. Old-school engineering. As noted in an earlier post, these stout beams were custom milled from island timber by David Kotz Woodworking of Day Road. Custom corbel cutting (the fancy scroll work at the end) was done by Casey, our construction lead. Now, here’s where the masons came in: The diagonal brace is supported at the wall by a protruding brick plinth. The newly rebuilt corbel plinth. Unfortunately, the plinth on this side had been hammered flat sometime in the past. But we still had the original plinth on the other side to model, plus those handy blueprints. The masons had to chip out the voids where the plinth was structurally set into the wall, then rebuild it to match. And match it they did. We marvel at the simple elegance of the bakery’s knee-brace design — truly, the B’s knees — which transfers the load of the porch overhang to the building wall. Nice engineering, Army architects of yore! And great work by our bakery restoration team, putting it all back together for the next hundred years. DIG THIS – PARKING LOT CONSTRUCTION BEGINS: These are the times that try the treasurer’s soul. At one point recently we had no fewer than 10 craftsmen working onsite at the Fort Ward bakery restoration: a slater on the roof, two masons working the walls, everyone else furrowing the very earth. With construction of the community hall’s new parking lot underway, extensive digging and trenching for the stormwater system dominated the week. It was maddeningly precise work, to ensure the system of vaults, catchments and lines were planted at just the right angle and depth – we’re talking fractions of inches – so as to convey rainwater from the southwest corner of the property out to the catch basin under Evergreen Drive. Installation of the custom stormwater filtration system as the Fort Ward Community Hall’s parking lot takes shape. The work was complicated by the discovery that seemingly every underground utility in the neighborhood converged right in the path of the new pipe, a veritable farrago of lines to be painstakingly dug around and skirted. This necessitated excavation with a noisy and not inexpensive “vactor” truck, a titanic vacuum that sounded like a 747 revving its engines for takeoff on the SeaTac runway. Sorry, neighbors! This is all in a good cause, we promise. And with no reported outages of power, cable or phone, we think we got it right. Through it all was the lumbering choreography of the heavy machinery, twin backhoes slinging gravel and earth to and fro in an elaborate mechanized dance. The rattling jackhammers. The thudding compacters. The buzzing generators to power them all. On a per-hour basis, it was probably the most expensive week of the whole restoration. We had to remind ourselves that at the end of the project, our Friends of Fort Ward bank account is supposed to say $0 and that’s okay. Heaven help us, not before then. In any event, our Park District construction team – David, Casey, Chris and Erik – gave 150 percent putting in the storm system, as did South Point Development Co.’s Dale Flodin, who moves earth with the precision of icing a cake. It gave us pause to reflect on our respective roles in the bakery restoration project. All your correspondent has to do is play General behind the lines – raise money, keep an eye on historical accuracy, and chronicle what goes on with reports like this one. On this week, the real heroes fought in the trenches. But isn’t that usually the case. FORT WARD, BAINBRIDGE ISLAND – Followers of the Fort Ward bakery restoration will recall what a thrill it was two summers ago, when we discovered the building’s original front double-doors and two fanlight windows –and with them, the prospect of reinstalling these vintage fixtures after 50-plus years out of the building. How could we follow that? Believe it or not …we’ve found two more original doors. They’ve been hidden away in a crawl space under the bakery’s raised floor for decades – since the Kennedy or Johnson administrations, by our best estimates – and on a recent morning, they came back out into the light. Restoration team members Casey and Sean of the Park District discovered the doors in December as they started tearing out the building’s false floor, but we weren’t able to extricate them at the time. But once we finally got them out for inspection, the doors lived up to anticipation. Like the original front double-doors, these doors are absolute monsters: 96x36x2.25in …. thick as bricks and stout as oaks, or in this case, firs. Same robust specs as shown in the original blueprints from 1908. They need to be cleaned up and refinished, but they’re in remarkably good shape. So we mounted the hinges and within a few minutes the door was up and swinging away — a perfect fit. We happened to have one of the original fanlight windows onsite with us, so we test-fit that over the newly hung door …. again, a perfect fit. Add a piece of framing over the door and attach a vintage knob, et voila — a historic doorway restored. While we’re just now starting to put the bakery back together after a protracted removal of non-original elements (tearing out the false floor closes out the demolition phase), this was our first really big “moment” where we could envision the finished product. Seeing the newly discovered door in place, the decorative fanlight above — even in their un-refinished state — that was worth a few words in the journal. Oh, and the second door fits the northwest entrance. So of the bakery’s five exterior doors, four will be original to the building – a restoration coup. Mostly we’re amazed that 50-60 years ago, when the Navy moved out of Fort Ward, private parties moved in and homesteaded the old bakery, raised the floor to create a crawl space and put in smaller doors, they had the foresight to go, “you know, someone someday may want these big doors again” and tucked them away like a time capsule … which on this day, we opened. And they were right. Most of the hardware was still on the doors. The door from the bakery’s kitchen. The door in place for the first time in many decades. 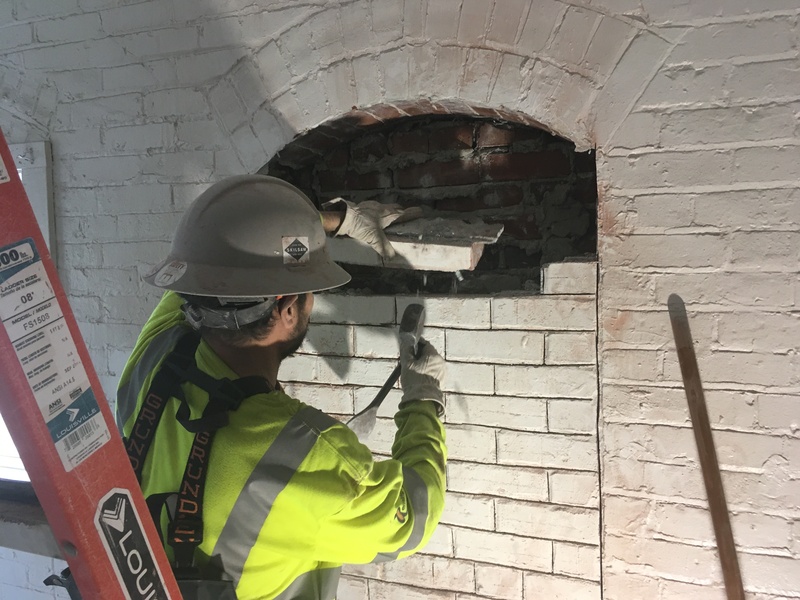 FORT WARD, BAINBRIDGE ISLAND — The ace duo from Masonry Restoration Consulting have been onsite for about six weeks now, giving Fort Ward’s historic brick bakery its nip and tuck. 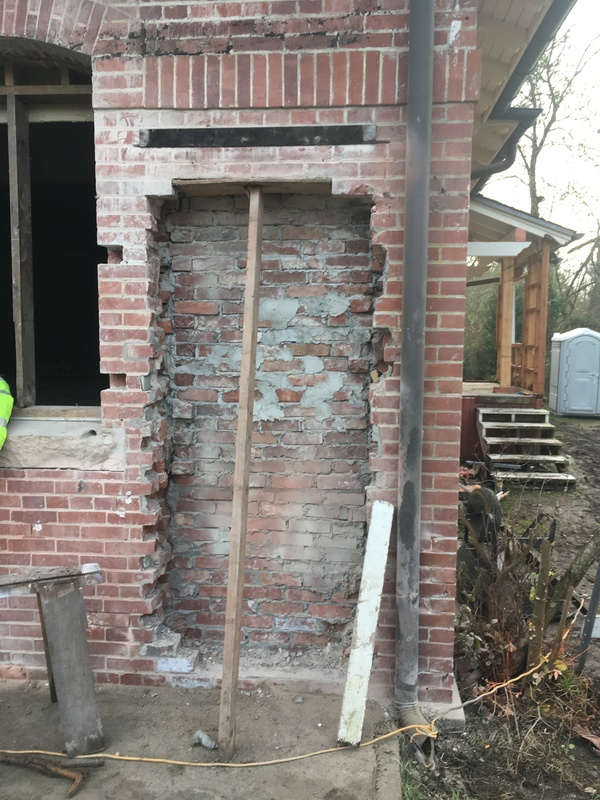 To date this has mostly been an exercise in addition by subtraction: opening up the big windows and doorways bricked over by the Navy in the 1940s, and removing damaged bricks and mortar for replacement and repointing. This week marks a significant turn: bricks are going back in. PJ and Toby have started on the north face, cleaning up window openings and filling holes, voids and breaches. They’re drawing from the stacks of newly reconditioned vintage bricks that have accumulated over the past few weeks, with new units to be mixed in where appropriate. After each brick is selected for color and fit, cut to size (as needed) and mortared into place — like removal, a very deliberative process — the visible gaps will be repointed with color-corrected mortar to match the aged and weathered material around it. We’ve found the existing mortar tends to have a yellowish hue, although after 100 years of random weathering it varies somewhat around the building and even on the same wall. But color tests continue, and we think the team is getting pretty close. Once the right hue is determined, final repointing should go pretty fast, and when it’s dry you should have to look pretty close to see the difference, old to new. And the first element of reconstruction: the corbel plinth to the left of the front doorway. The original plinth — a little protruding brick ledge that buttresses the two stout beams holding up the front porch overhang — was hammered away decades ago when the porch was enclosed. This morning, PJ built a new plinth to match the one on the other side of the doorway. Once the mortar has firmed up, we can install the new beams and peel away the last vestiges of the ugly wraparound that has blighted the facade since the 1960s or ’70s. Here’s a slideshow of today’s work, including the bakery’s new corbel plinth. 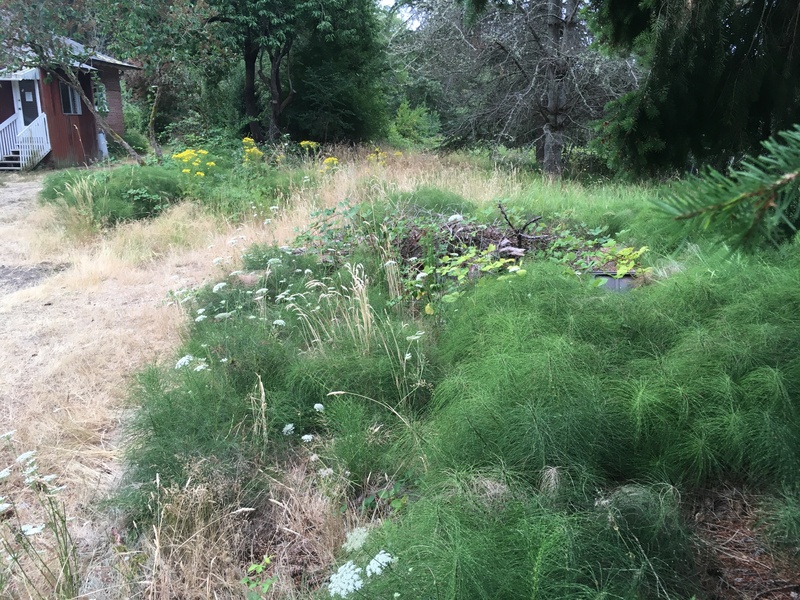 FORT WARD, BAINBRIDGE ISLAND – Happy New Year from Friends of Fort Ward and the Fort Ward Community Hall project! The turning calendar finds us knee-deep in sawdust, awash in the vigorous clatter of our historic bakery restoration (minor pause for the holidays), and propelled by great press coverage and your ongoing enthusiasm and support en route to project completion in 2019. From a dream, to a concept, to a plan, to this moment: the Fort Ward Community Hall is happening. 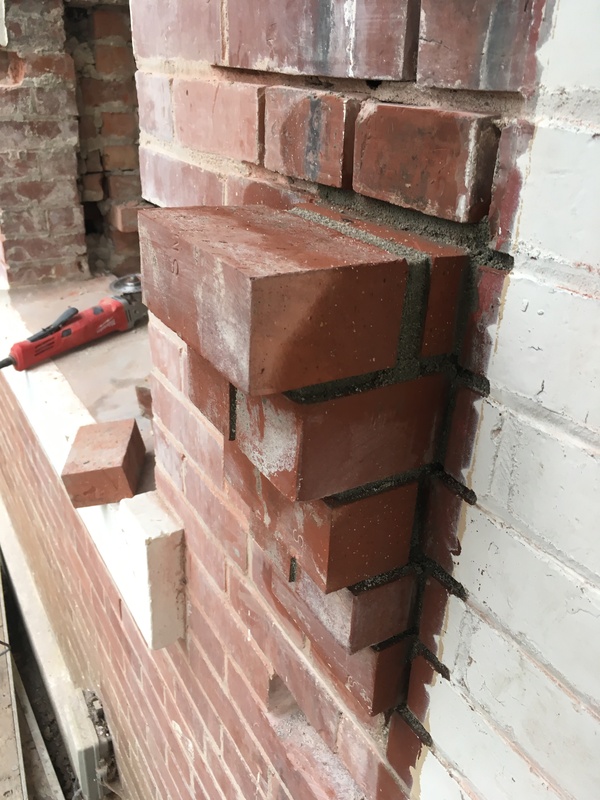 An ace team from Lake Stevens-based Masonry Restoration Consulting has been onsite for the past six weeks, giving our little brick bakery a thorough makeover. 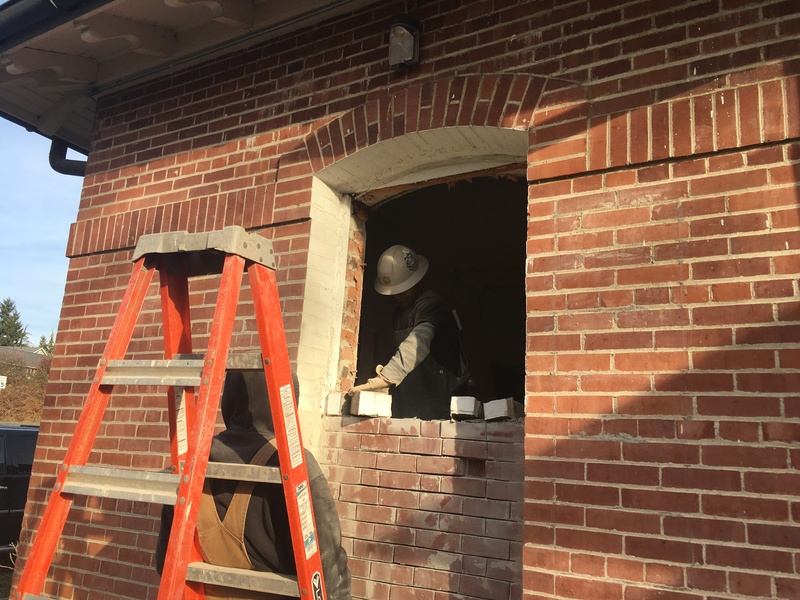 These skilled masons recently reopened all windows and doors bricked over by the Navy back in the 1940s, and are now replacing damaged bricks and generally giving the building envelope a good nip and tuck. We’ve posted video and stills of their work on our Facebook page and homepage, so you can see these skilled craftsmen in action. It’s painstaking work, and possibly the biggest single component of the restoration … but it’s a brick building, so you’d expect that. Bricks are its essence, so they deserve the attention. This phase of the restoration is funded in part by a Sivinski Grant from the WA Trust for Historic Preservation. Recall that this prestigious award was Our Very First Grant (way back in December 2015! ), and we’re pleased to finally be spending the “brick & mortar” money on actual brick and mortar. Cheers to the WA Trust for all they do for the cause of historic preservation, and their early support of the bakery restoration. Fill and grading for the community hall’s new parking lot begins in early January. The schematics look complicated, but three key points: the drainage will boast custom filtration to keep pollutants out of the waters of Rich Passage, we’re keeping asphalt to a minimum, and we saved most of the significant trees. Design is by Browne Wheeler Engineers, with grading and earthwork by Dale Flodin and island-based South Point Development. The slate specialist from Hanley Construction will be on the roof in the next few weeks, tweaking the bakery’s slate shingles to keep the Northwest winter out. The beautiful slate roof is one of the 1910 building’s signature elements, and we’re glad to be shoring it up for another 100 years. Slate tiles for the patch-up are being contributed by the Dennon family on Parkview Drive, supplementing a cache of tiles from top-secret Station S.
Casey Johnson and the team at Port Madison Wood Floors stepped up this year as major contributors – this excellent island firm is donating materials for a beautiful white oak hardwood floor in the hall’s main room. A tremendous gift, which everyone who uses the building will enjoy. Flooring installation and finishing costs will be funded through a community grant by the Bainbridge Island Parks Foundation. We expect the floor to go in sometime in March. More big thanks to the Suquamish Foundation for a recent $500 grant. Our neighbors across the bridge have been staunch supporters of our Fort Ward project, with the Foundation’s contributions totaling $4,000 to date. Donations continue to roll in through One Call For All – we are enjoying great support in this, our final Red Envelope campaign. If you’ve given previously, we are so grateful – you’ve gotten us this deep into the bakery restoration. If you want to pad your support or want to join the campaign for the first time, now’s your chance to make your mark on this neighborhood-driven, historic preservation effort. 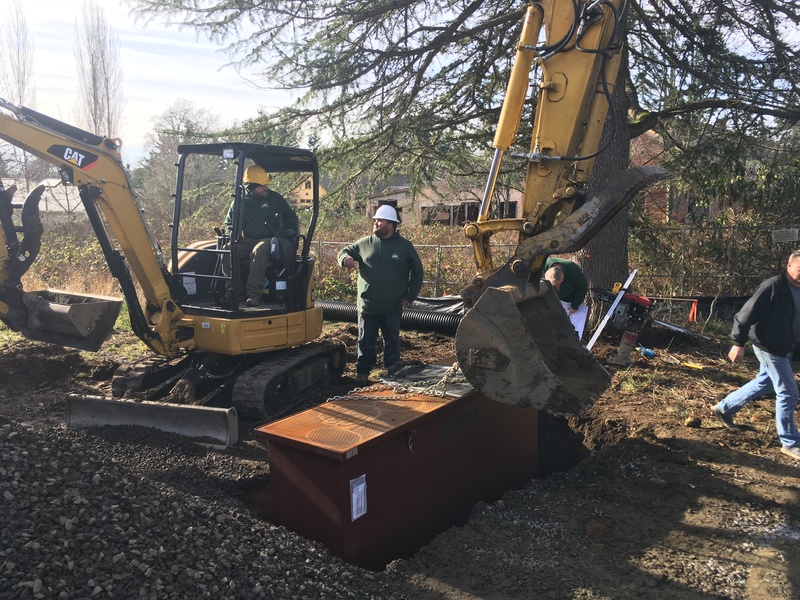 The Fort Ward Community Hall project remains a three-way partnership of Friends of Fort Ward, the Bainbridge Island Metro Park & Recreation District, and Kitsap County (Fort Ward) Sewer District No. 7. We’re also grateful for the ongoing support of Wenzlau Architects, Browne Wheeler Engineers, and Tina Gilbert of the OTWB Inc. project management firm. And our onsite team of David, Casey and Sean from BI Parks. And many, many others! And so… Welcome 2019! The year we bring the Fort Ward Community Hall project home – for Bainbridge Island, for historic preservation, for community, all thanks to the continued enthusiasm and support of … You. The Fort Ward Community Hall project gets some great coverage from the Bainbridge Island Review in this week’s edition, now available on finer newsstands across the island. 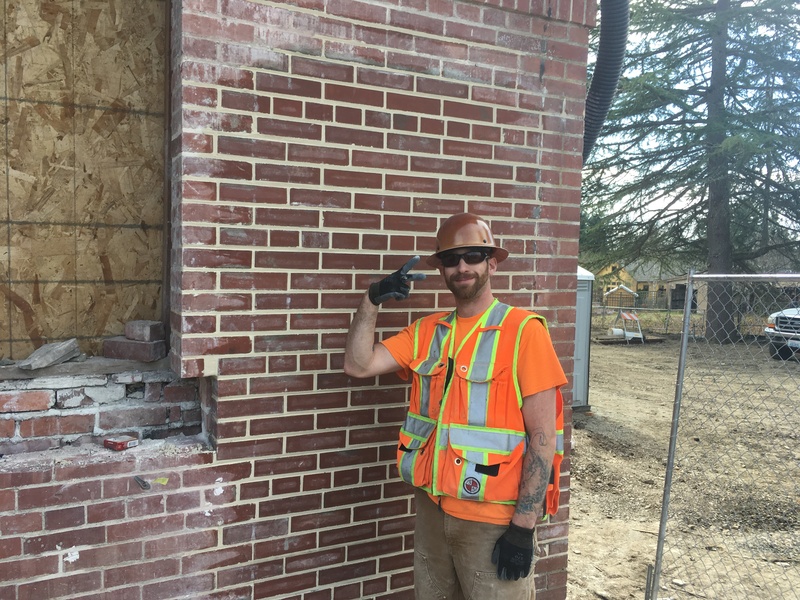 Big thanks to the Review and editor Brian Kelly for taking the time to venture south to Fort Ward on a recent afternoon to see the masonry restoration phase of our project. What a great way to close out 2018, celebrating current work and looking ahead to bringing the historic bakery restoration home over the next few months. Pick up a copy today (just 75 cents! ), and support the hometown press as they chronicle the many facets of our Bainbridge Island community. Thanks, Review! FORT WARD, BAINBRIDGE ISLAND — It’s been about 75 years since sunlight streamed through the windows of the Fort Ward bakery building. Bricked over during WW2 (when the Navy converted the building into a power station, and put a big, noisy generator inside), most of these portals have remained closed, tainting the façade and obscuring a key feature of the building’s colonial revival design. PJ of Masonry Restoration Consultants opening a window on the north wall. No longer. Thanks to an ace team of restoration masons, the bakery’s deep windows and towering doorways have been fully reopened for the first time in lo, these many decades. It’s a milestone moment as we restore our little 1910 bakery for public use as Fort Ward Community Hall. The occasion falling somewhere between Thanksgiving and Christmas, we mark this moment with both profound gratitude and the promise of still better things ahead. Indeed, as we write this, the bakery restoration is now in full swing, highlighted by the masonry makeover. 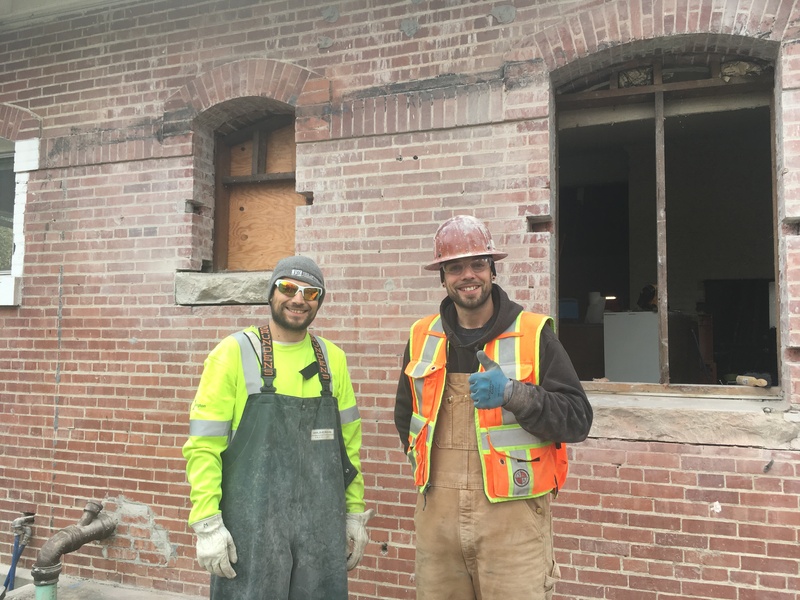 The able and industrious team of PJ and Toby, of the Lake Stevens firm Masonry Restoration Consulting, have been hard at work for the past few weeks, undertaking a range of repairs around the bakery’s lovely shell. Per the rigorous Secretary of Interior’s Standards for the Treatment of Historic Properties – the preservationist’s bible — the team eschews masonry saws and clumsy, abrasive methods in favor of old-school hand tools and techniques. After scoring the old mortar with a diamond blade (permitted under the standards), the team goes to work with the hammer and chisel, meticulously freeing up each unit, one by one. It’s painstaking work, but as is so often the case, the old ways are best. And while the walls are in generally good shape – thank the generous eaves and gutters for keeping rainwater away from the shell – the list of refurbishments is extensive. A corbel plinth that holds up the front porch overhang will be rebuilt to match the existing plinth on the other side of the doorway. All around the building, worn and crumbling mortar joints are being dug out and repointed, broken bricks painstakingly removed and replaced. A badly patched area the size of a door will be rebuilt. Old paint and random smears of mastic, mortar and other stains will be cleaned up. Perhaps most exciting, two hewn sandstone sills on the north face – which some visigoth hammered into oblivion, reasons unknown — will be pulled out and replaced with newly harvested stones from a quarry in Tenino. We’ll have a special post coming up on this project element alone. Taken together, masonry restoration is possibly the single biggest component of our bakery project. But you might expect that: it’s a brick building. Bricks are its very essence. We should add there’s lots going on inside the building these days too, and we’re pretty much knee-deep in dust – a mark of progress! Meanwhile, a load of materials for the hall’s new parking lot showed up this week, work that we’ll be detailing in a future post. Remember that you can find our most up-to-date news at our social media page, www.facebook.com/friendsoffortward. Like us! (And ask your friends to Like us too.). And follow along in our historic restoration adventure. For now, celebrate with us as we mark our masonry restoration milestone. Because today we can stand inside the bakery and turn 360 degrees, and everywhere we turn, we see glorious daylight. It’s been a while since anyone could say that. THE YEAR-END DONATION PITCH: Of course, all of this is costing some money. If you’ve supported the Fort Ward Community Hall project to date: THANK YOU! Your generosity has gotten us this deep into the restoration. With the year-end giving season upon us, we would welcome your continued support through One Call For All (www.onecallforall.org). Please give as you can, even as we do our best to reward your faith with a restored community hall opening in spring 2019. And if you’re new to the project – just moved to the island perhaps, or you’re reading from around the country – please join the Fort Ward team! Your tax-deductible gift through One Call For All will help push this unique historic preservation effort over the top. We’ve picked up a lot of national interest in the past year, thanks to the good folks at Friends of American Forts and elsewhere. Thanks for following along, and please consider a gift to our Little Fort at Bean Point. Remember that Friends of Fort Ward is an all-volunteer organization, and all contributions go to project costs. Make some history! Restoring the Fort Ward bakery building’s classic façade has been a key goal of the restoration now underway. One of the more prominent design elements is the porch above the front entranceway, a structure that after 108 years is fortunately still intact – for the most part. The overhang was originally supported by two pairs of robust, 6×8 fir beams. As you can see from the drawings, the upper beam was cleverly notched to support an angled, lower brace, which in turn rested on a plinth of bricks protruding from the building face. A nifty piece of engineering and design, simple yet elegant. Sadly, all three structural components on the north side of the doorway (left as you face it) – both beams, and the plinth — were destroyed when the porch was enclosed by a homeowner sometime in the 1960s or ‘70s. Fortunately, we still have the other set in place to measure and copy, plus the original blueprints from the National Archives to work from as well. No problem! While we’ll get around to rebuilding the masonry plinth soon, this week it was all about the beams. On Tuesday we headed up to David Kotz Woodworking, a busy working mill on a knoll off Day Road west of the highway. The mill recently turned out all the sturdy fir and cedar planks for the amazing new boardwalk at Hawley Cove Park. 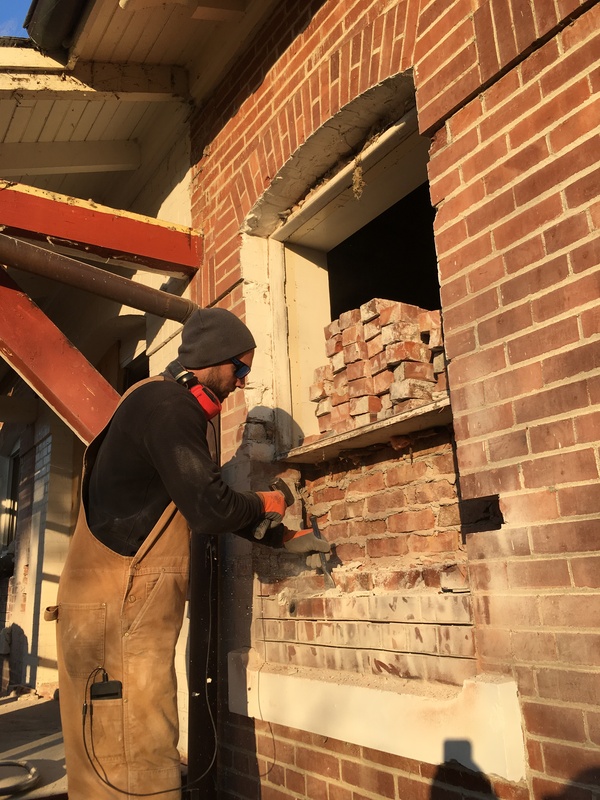 On this day, David and his team would be custom-milling two beams for the bakery’s restored front porch. David poked around in the raw log pile for a bit before selecting a suitably massive chunk of Douglas fir, estimated to be 95 years old when it was harvested somewhere on Bainbridge. An island tree for a historic island restoration! David trimmed the log to approximate length with a chainsaw. Then it was up to Brent Herrick to run the log through the milling machine. Cut by precision cut over the next hour, two 8-foot beams were hewn from the very heart of the log — stout, straight and true. Outstanding work! We still have a little more work in the coming days to notch the upper brace and add the corbel cut (beam-end detailing) for aesthetics. That will be the subject of a future post. For now, we’re so grateful to David Kotz Woodworking for the care that went into custom-milling these beautiful beams for us to work with. (And glad to keep our donors’ money on-island with these fine craftsmen.) These aren’t some anonymous hunks of wood that will be plugged in somewhere and forgotten; they are prominent architectural elements, essential to the classic look of the building that we’re bringing back. Whenever you come and go from the Fort Ward Community Hall, you will pass by these beams. We hope you’ll pause to admire them. Evergreen Drive neighbors will see increased activity around the bakery building this week, as the Park District begins a cleanup of the area west of the building — random brush, some scrap metal that has piled up over the years, and the inevitable old tire or two will be hauled off for disposal. This is the first step in creation of a parking area for the forthcoming Fort Ward Community Hall. If you have any questions about the work, please email us at history@fortwardhall.org. FORT WARD, BAINBRIDGE ISLAND – A journey begins with a single step, and restoration of Fort Ward’s historic bakery building commenced with footfalls on the threshold: Mike Reese, who grew up just up the hill in one of the fort’s NCO quarters (Building 20), now lives along the Parade Ground in retirement, and enters these new annals as our first restoration volunteer. Fort Ward salute! The building has been on its own journey, 108 years and counting, from Army bakery to Navy powerhouse to private residence to community-hall-in-waiting. As we’ve chronicled in this forum, it has undergone many changes through the decades, through various chains of command and title. Our project is about undoing these changes one by one, and restoring the building to its original 1910 look and feel while upgrading the underlying systems for contemporary public use. 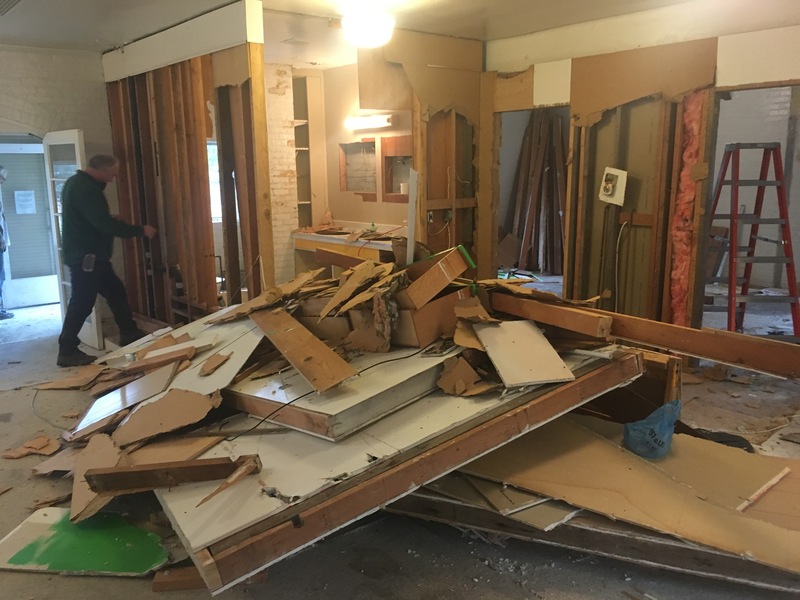 Today marked our first opportunity to check off one item from the list: demolishing interior partition walls that were added sometime in the 1960s to carve a bathroom and closet out of the main hall, along with some cheap wall-hung cupboards throughout. And whatever else might happen to get in our way. Mike was followed shortly by David Harry, William Doyle and Casey Shortbull from the Park District, a hardy crew bearing various small tools, pry bars and the obligatory Honey Bucket. (The building’s water will be shut off indefinitely.) A 10-yard tote from Bainbridge Disposal soon touched down at the doorstep, and restoration of the Fort Ward bakery building was officially underway. The next few hours were marked by the roar of reciprocating sawzalls, the heavy thudding of mauls, and the tortured shriek of nails giving way as beams united since the Kennedy administration were unceremoniously uncoupled. The occasional ZING! of sparks suggested that yes, those two wires might still be live. No fatalities were reported. For ostensibly “temporary” walls, the bathroom and cabinets were remarkably solid and absorbed quite a pounding en route to disposal. A lot of the old fir 2x4s were still straight and true even so, and so were channeled off for reuse once we get around to putting the interior back together. Nevertheless the debris piled up at an awesome rate. The crew filled the 10-yeard tote to capacity within a few hours, then moved on to the kitchen and amassed another formidable mound of debris for eventual haul-off. Time for a break. The team finally knocked off around 3:45 p.m. with a resounding first day of work in the books. With the dust settled, we had achieved our first goal – restoring the bakery’s 1,100-square-foot main hall to its original rectangle. For the first time, we could look across the room and actually see the whole room – someday soon the site of classes, parties, Scouting events, and all the other great, family-friendly activities for which our island’s historic halls play host. Right here in Fort Ward! The imagination soars. Note that the carport’s demise will lay bare some unfortunate damage from years past. At some point in time, a misguided resident (perhaps even the Navy, who can say) hammered away two of the ornamental sandstone sills on the north face of the building. These will be, unfortunately, very expensive to replicate and replace, with estimates in the many thousands of dollars. Until then they will give passersby an idea of the magnitude of the restoration, and the care and attention to detail with which we hope to complete it for the sake of historical accuracy, our grail. Our little bakery building deserves nothing less. A powder-pink bathtub minted in 1966. Let’s consider this last for a moment. In that we already knew the building came with a pink bathtub, this was not a “find” per se. But we’ve had no idea how to date it, except that the color suggested a decade in which bolder, more daring hues were en vogue. Now we know: the bottom of this cast-iron beauty is stamped with the date of manufacture, the same year “The Sound of Silence” and “Monday Monday” topped the pop charts, the original “Star Trek” premiered, and England beat West (!) Germany to win the World Cup. The tub may not be well traveled, but it’s well seasoned. SALVAGE OPPORTUNITIES FOR YOU! We are now accepting offers on the powder-pink bathtub and two matching pink basin sinks. They look mildly “distressed” at the moment, but the enamel can easily be polished up for another 50 years of gleaming service, and they would be great conversation starters in any retro-chic loo. (Alas, the toilet we pulled out was not pink. If only.) If you would like these fine vintage fixtures, make us an offer – feel free to bid high, as all proceeds go to the restoration. Otherwise they will be sent off to one of the second-hand building stores across the water, to be snapped up by the hipsters and trendsetters of Seattle. Also available: three hollow interior doors with frames and hardware, cheap but intact; two mirrored medicine cabinets in nice shape; and a small wooden bureau that would be okay for garage or basement storage. Inquire within. And so, we begin. After more than three years of fundraising, friend raising, planning and public review, work starts today on restoration of Fort Ward’s historic bakery building. When we’re done – sometime, we hope, late in 2018 – the island will have a new historic meeting hall, interpretive site, and monument to local heritage preservation: Fort Ward Community Hall. It’s a big moment, and we want to share it with you, our supporters, and reflect on how we got this far. 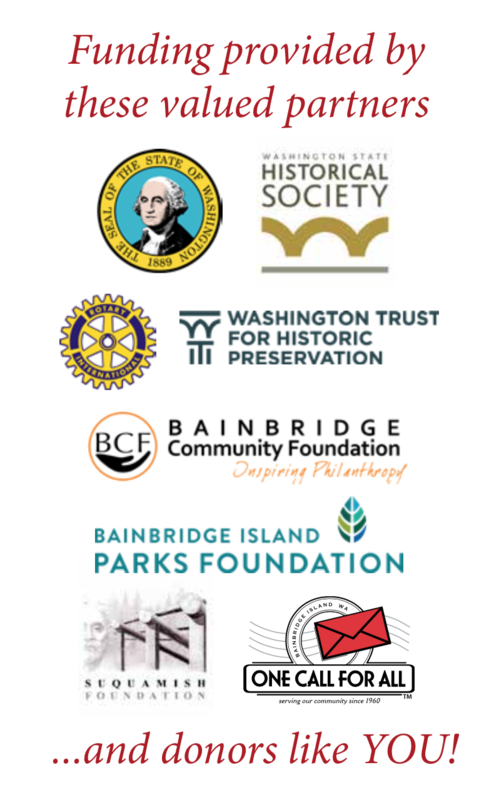 First off, we need to acknowledge out project partners, the Bainbridge Island Metro Park & Recreation District (our general contractor) and Kitsap County (Fort Ward) Sewer District No. 7 (building owner and as such, cornerstone investor). When we presented this idea to the Park District at a neighborhood meeting at “Station S” back in 2015, they signed on without hesitation to contribute horsepower and expertise. And the project is only possible because our neighborhood utility district had the foresight to purchase the bakery building for a community space back in 2007, many years before we even had a plan to bring it about. We owe a huge debt of gratitude to Wenzlau Architects, Browne Wheeler Engineering, and Fischer Bouma Partnership landscape architects. The cost just to get to groundbreaking has been high; it would have been considerably higher but for the generous contributions and considerable expertise of these three island firms. We’re particularly indebted to Charlie and Ariel at Wenzlau for helping us through the permitting process – necessarily rigorous, sometimes frustrating, ultimately successful. Thank you both. Bainbridge Island Rotary was an early and key supporter through its Judd Huney Fund. Bainbridge Community Foundation, Bainbridge Island Parks Foundation and the Suquamish Foundation have also made outstanding contributions, as have local businesses including Fairy Tale Dental, T&C, ACE Hardware and OTWB Inc. The City’s Historic Preservation Commission played its role, shepherding changes to the city code that cut red tape and permit costs for historic building restorations like ours. Neighborhood kids – our Fort Ward Youth Board, versions 1.0 and 2.0 – brought the enthusiasm and vigor of youth to our outreach. And of course, we thank the many donors – dozens of island families and individuals – who have invested both funds and faith in the project. It takes vision and trust to support a capital campaign whose horizon has been, to this point, somewhat hazy. We’re grateful to all who have latched onto the Fort Ward bakery building and its history, subscribed to the idea that our local heritage is worth preserving, and given generously to help create a community hall to complement those at Island Center, Seabold, and Yeomalt. We now set out to reward your faith. Groundbreaking (if that is right term for a building renovation – we may have to shovel some dirt just for the occasion) commences today. The first phase will see a “controlled demolition” – undoing all of the changes made to the building over the decades, with the goal of restoring it to its original, 1910 glory. Some of these tasks will be relatively easy and cheap: taking down the carport, tearing out interior walls and flooring, peeling away the tumbledown porches that have been grafted on front and back and mar the classic facade. In the coming weeks and months, we’ll contract with an expert in masonry restoration to reopen to full depth those big windows bricked over by the Navy in the 1940s and address smaller needs. Materials will be recycled and reused wherever possible. Anything of salvage value will be repurposed within the building, made available on the used-materials market, or offered to islanders for a small donation to the project. This will include everything from doors and windows to the vintage pink sinks and matching bathtub. 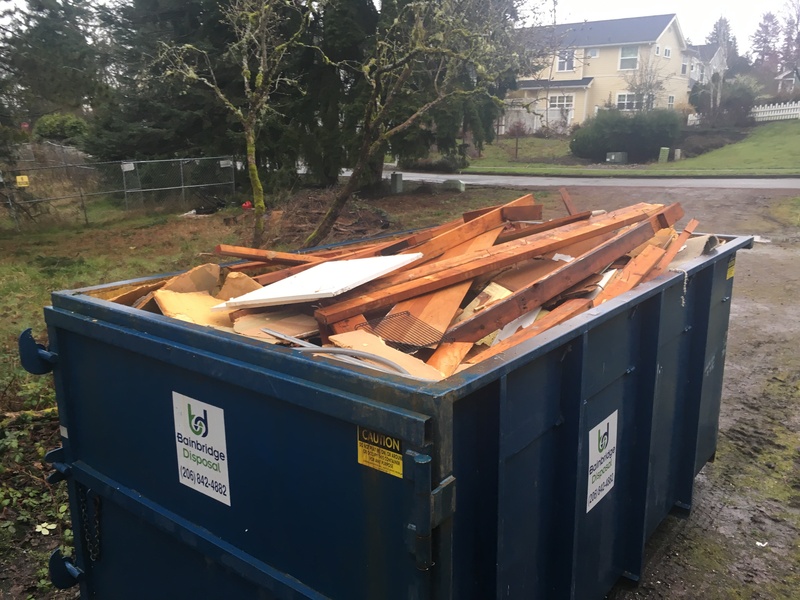 If you have a construction project coming up – be it a mother-in-law apartment or just a backyard chicken coop – and are looking for used materials, drop us a line. We might have something for you – funky perhaps, but with an interesting provenance. Then comes the more formidable task of restoration. While much of that work will be relatively straightforward, we’re already learning that some will be more involved and expensive than we anticipated. Example: Sometime over the years, a misguided resident hammered away two of the hewn sandstone sills on the north side of the building. That damage will be laid bare as the carport comes down. Sourcing replacements (even reproductions) will run into many thousands of dollars – but we believe these ornamental sills are absolutely essential to an accurate and acceptable restoration of this beautiful, architecturally striking building. Other surprises and challenges may await. Are we done raising funds? No – we’ll need more contributions to complete the restoration and dedicate the hall for public use. The outstanding financial need will come into clearer focus as we get work underway and start checking off each task one by one. We’ll economize where we can. But if you have considered supporting this project with a contribution, or would like to make another gift, this is the time. We’re moving from idea to actuation. The Fort Ward Community Hall is really happening – starting now. We believe the community will come together in our capstone phase and help us complete the project this year, with tax-deductible contributions through Friends of Fort Ward (our all-volunteer, neighborhood 501(c)3), One Call For All, and our local Foundations. Follow our progress at www.fortwardhall.org and wwwfacebook.com/friendsoffortward. With permits in hand, a respectable fund balance and an expert restoration team ready to go, now is the time. And so, we begin. We hope you’ll follow along, and we carry your support and good wishes with us.